While I am not particularly a Milwaukee Bucks fan, I love the NBA and enjoy watching any new rising, exciting teams play. Thus I was definitely tuning in at times to watch the Bucks as that team has the incomparable Giannis Antetokounmpo, who only leads his team in points, rebounds, assists, steals and blocks. The Greek Freak is the alpha dog. But to win a title in the modern-day NBA, you need a star wingman. The Bucks appeared to have that with Jabari Parker, the No. 2 overall pick in 2014. Parker's rookie season was cut short after 25 games due to a torn ACL in his left knee. The experts say it often takes a full following season to get back 100 percent from that. Parker was pretty good in 2015-16 in averaging 14.1 points and 5.2 rebounds. This year, he looked fully healthy and started to show future All-Star form in averaging 20.1 points, 6.2 rebounds and 2.8 assists while shooting a career-high from 3-point range. Alas, last Wednesday Parker left a game with what was called a sprained knee but turned out to an ACL tear in the same knee. Now it's fair to wonder if he will ever be the same player. Derrick Rose never was after multiple procedures on his knee, and he never tore the ACL twice. It's an utterly crushing blow to the Bucks, who can only build through the draft - the Freak was a flier choice at the No. 15 pick in 2013 -- because top free agents aren't spending their winters in Milwaukee. This news means the Bucks probably miss the playoffs, which is frankly better long term in terms of getting into the lottery. As for the rest of this year? I'll be betting against the Bucks more and leaning more toward the under in their games without Parker. Toronto lost its second in a row Sunday, getting upset at home by Detroit 102-101. All-Star DeMar DeRozan had a 17-foot shot to win the game but could only hit the rim with 0.9 seconds left. The Raptors, who led by 16 in the fourth, shot 50.7 percent from the field to Detroit's 42.9, but the Toronto bench had a scant 23 points, or one point fewer than Pistons reserve Tobias Harris. Chicago lost a third in a row Sunday, 117-89 at Minnesota to close a six-game road trip Jimmy Butler, Dwyane Wade, Nikola Mirotic and Paul Zipser were all out injured. The Bulls were down 19 in the first quarter and the game was over. Butler aggravated a bruised right heel on Friday night against Phoenix.Wade missed the game with a swollen right wrist, and X-rays showed no fractures.Chicago beat Toronto 123-118 in OT on Jan. 7 and has won the past 10 in the series, six in a row at home. Key trends: The Raptors are 1-10 against the spread in the past 11 meetings. The "over/under" is 8-0 in the past eight. Early lean: Wait on Butler and Wade, but I expect the Raptors to end the skid in this series regardless. First of an NBA TV doubleheader.Cleveland beat Denver 125-109 on Saturday. LeBron James and Kyrie Irving scored 27 points apiece. The Cavs opened the third quarter on an 18-0 run to pull away. Kevin Love played Saturday but tweaked his knee and won't here against his ex-club. I would be surprised if he plays before the All-Star break, and his status in that game is up in the air. Minnesota trashed short-handed Chicago 117-89 on Sunday as Coach Tom Thibodeau got a satisfying season sweep of his former team. Thibs kept his starters in deep into the fourth quarter to push the lead as high as 30. 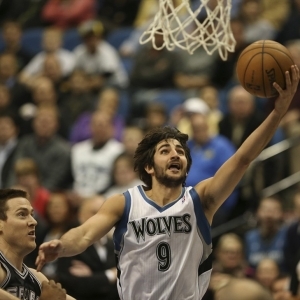 Ricky Rubio had 17 points, 11 assists and six rebounds and the Wolves shot 54 percent. Cleveland has won the past five vs. Minnesota, by an average of nearly 20 points, including 125-97 on Feb. 1. Key trends: The Cavs are 1-5 ATS in their past six following a double-digit win. The over is 6-0 in their past six. The over is 7-0 in Minnesota's past seven. Early lean: Wolves and over. Second NBA TV game. Sacramento won a third in a row Sunday, 105-99 over New Orleans. DeMarcus Cousins had 28 points, 14 rebounds and seven assists for the Kings but did get a 17th technical of the season, so one more and he must sit out a game. Sacramento finished a six-game homestand at 4-2. The Lakers took advantage of the emotionally-crushed Bucks with a 122-114 upset in Milwaukee on Friday to conclude a five-game road trip. Nick Young scored 26 points. Timofey Mozgov got a DNP-CD for the third straight game. Did I mention the Lakers for some reason gave him a $64 million contract in free agency this past offseason? Sacramento and the Lakers have split two meetings year, both in Sac-Town. The Kings have won their past three in L.A.
Key trends: The Kings are 7-2-1 ATS in the past 10 meetings. The under is 4-0 in the past four meetings. Early lean: Kings and under. Get free picks from any Doc's Sports handicapper - there is no obligation for this offer and no credit card required. Just sign up for an account, and you can use the $60 in free picks for any Doc's Sports Advisory Board handicapper and any sport. Click here to get started now .